However in some cases it may be necessary to activate MATLAB directly, either on the MathWorks website or using the MATLAB activation client. How can I install MATLAB or other MathWorks products on an offline machine? How do I transfer a Concurrent or Network Named User MATLAB license to a new server? In the "Resources" section of the toolstrip, open the "Help" menu. Hover over the "Licenses" submenu. Click "Activate software." This will launch the MATLAB activation client. Click on "Show Package Contents". I have a license manager error-9 (my username doesn't match the username in the license file) and I cannot launch Matlab. I would like to run the activation client as it is recommended for windows 8, but C:\Program Files\MATLAB\R20XXx\bin\winXX\activate_matlab.exe sends me to an error File. How can I solve this problem? Anne-Sophie, you need to replace the Xs with the correct version number (e.g. R2016b). Presumably the same goes for the the winXX part. If you're unsure you can find the correct folder in your file explorer (i.e., click the Windows-button and 'e' on your keyboard to open it). Good catch. I've updated the article accordingly. Thank you. While activating the Matlab software, my licence checkout failed because a I gave in the wrong username, is it possible to do the licence activation over? Yes, you can run the activation client again. How do you run the activation client again? You follow the instructions in the main answer, which is broken down by operating system and broken down by whether you are able to start MATLAB or not. I got the same error message as well. It would have been helpful if the activation manager made it explicit that it requires my local machines user id and not the one I created during the registration for matlab. We will need more information than that. What error message are you encountering? Which version of MATLAB are you working with, and which operating system? Do you have a direct connection to the Internet or are you working through a proxy server? Just a quick edit for those in Ubuntu 16.04. 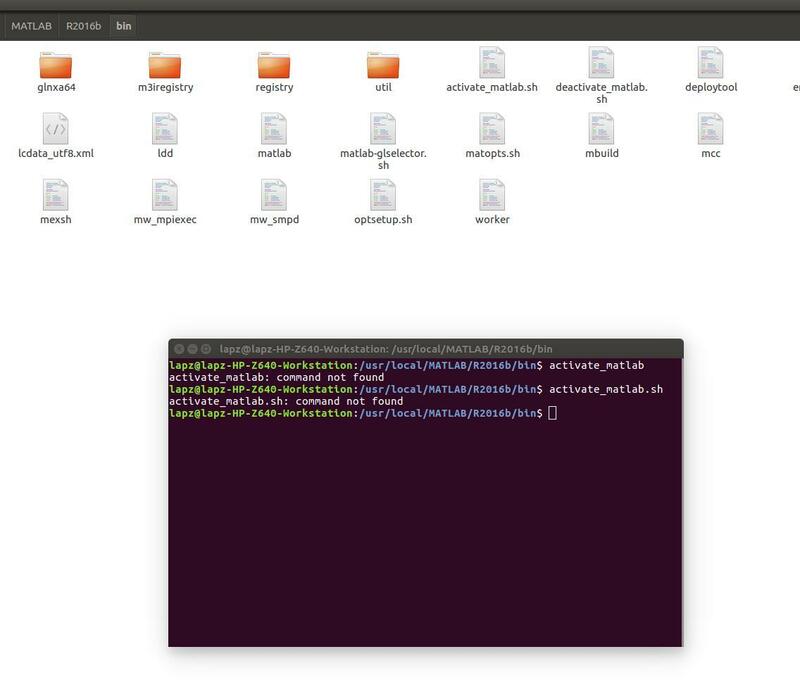 If I go to the location described and right-click on the folder then "Open in Terminal" then type in "activate_matlab.sh" you will get a "command not found error"
Didn't help me at all. I wonder if that is because when this was a win10 machine it had matlab on it. If so matlab is screwing this up. Patrick did specifically say "Just a quick edit for those in Ubuntu 16.04"
Please expand upon your question? None of the links uploaded here lets me activate matlab, any useful one pls?? thank you. Select "Activate automatically using the internet." Log into your MathWorks account Select the license from the list of licenses you would like to activate Confirm the activation information. Click "finish" to complete the activation process. How to solve this problem in the case of osx system that matlab has been unable to start? What to do when activate_matlab.exe does not open / fails silently? Win7/64, MATLAB 2018b, used to work fine. Look in "C:\Program Files\MATLAB\R2019a\bin\win64" since you're using a 64 bit version of Windows.